You faithfully separate your paper and plastic recyclables and purchase phosphate-free laundry detergent, but a look at your cleaning cabinet reveals bottles displaying skulls and crossbones. Sure, you know that harsh chemical cleaners aren’t the best for the environment, but how else are you expected to clean your home? Purchase environmentally friendly cleaning products. Put away the bleach and look for green cleaning products. With DropShot cleaners, along with cutting plastic bottle waste, you pay for its incredible cleaning power – not water! The cleaners use the safest chemicals available, though, like all cleaning supplies, they should be kept away from pets and children. Stop using paper towels. For windows, try using a soft cloth, like an old T-shirt. If you must use paper towels, look for brands that contain 100 percent recycled materials. 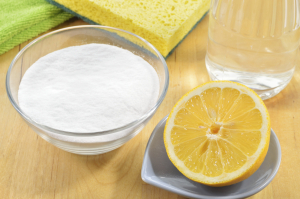 Use baking soda instead of fragrance sprays. Fresh-smelling air doesn’t come from an aerosol can. If you want to banish funky odors, try sprinkling a scant amount of baking soda into your carpet. The baking soda will absorb odors. A little vacuuming, and you’ll find yourself with an odor-free carpet. House plants, too, can helpfreshen the air. Chrysanthemums, English ivy, spider plants and Boston ferns can all improve indoor air quality, though you shouldn’t buy a plant without first checking to make sure that it will be safe around your pets.